Throughout my time as a gamer, I have seen game designers struggle with immersion because not everyone views immersion the same way and every designer wants his game to pull you in. The more you play one designer’s game, the more likely you will buy his or her next game. In the case of MMOs, the greater the immersion, the greater chance you will spend more money on subscriptions or in the cash shop. Some gamers find first-person views with in-your-face action immersing; some, like me, find rich lore and a solid storyline immersing. The Elder Scrolls Online faces perhaps the hardest task. Not only does this game strive to immerse the already existing divisions between the RPG crowd, but it also has to contend with the different platforms on which it’s releasing. Our commenters on this site are heavily divided on the console-vs.-PC subject. To top it off, some have already been turned off by Bethesda’s shying away from calling the game an MMO. 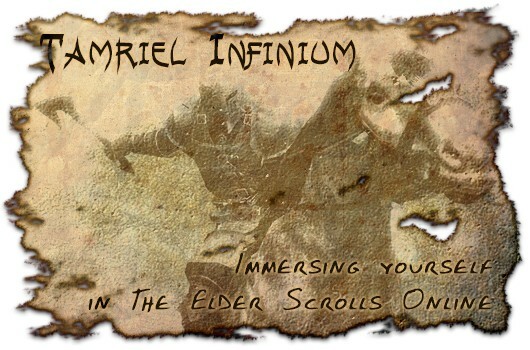 Today, I face head-on some of game’s immersion pitfalls and tackle the divisive comments from last week’s Tamriel Infinium. The Elder Scrolls Online has deep and extensive lore; the history of Tamriel spans thousands of years. The nine different player races have solidified their personalities in 18 different games and expansions. Given this level of lore development, I’m slightly surprised the franchise didn’t attempt an MMO before now. However, knowing how rabid the Elder Scrolls and MMO fanbases are, I can sympathize with the publisher’s reluctance to step into the market. When you’re playing a single-player game, it’s fine to have situations where your character doesn’t say anything or maybe your character is voiced by a single actor. And in the primary storyline for your MMO character, it’s fine to have one voice as well. But when you’re interacting with other players, things start to get hairy as far as immersion is concerned. I don’t know about you, but I find it odd when I’m running quests with another person and his character sounds exactly like mine — even if it’s not a fully voiced MMO. Then there is the issue of interpersonal communication. We touched on this a little bit a couple of weeks ago with factional divides, but what about the people standing next to you or those in your party? I find it detracting from my immersion if I have to look away from the character I’m talking to see what he’s saying. That’s why in games without chat bubbles, I try to keep the chat box as close to the middle of the screen as possible. Unfortunately, ESO has yet to explain how this going to work, especially since the game is going to release on consoles as well. Are we going to have a spatial voice chat as in APB, Neverwinter, and DC Universe Online? I hope not; those are the most horrid VoIP systems I’ve ever heard. My deepest immersion happens when I lead my own adventure and discover quests without prompting from some tour-guide dotted line or exclamation point over an NPC’s head. From the previews that I’ve read, ZeniMax has nailed this one. Being able to randomly pick up items and talk to NPCs sounds like the beginning of great world design. I am holding out hope that ZeniMax will nail the communication part of the game, too. Frankly I think it is a pretty stellar idea. MMOs as a genre are kind of a mess right now, and in several ways dubbing something a new game an MMO probably has more negative connotations than positive ones. Worthless story, endless grinding, and an obsession with gear are all things that have become fairly synonymous with MMO play. These seem to all be aspects of play that the MMO crowd prefers while simultaneously complaining endlessly about them. They’re also aspects of play certain to turn off anyone who isn’t already a big fan of the genre. Maybe shying away from the “MMO” title is a healthy thing for any game trying to do more than rehash wow. When I spoke to a developer friend about the compromises of a multiplatform launch, he told me that there are always cutbacks in game design no matter the number of platforms. The ideas always expand beyond the realistic scope of the project, and developers will narrow that scope based on the weakest platform. However, in the particular case of ESO, he believes that the MMO side might be scaled back but that it can easily be a very good Elder Scrolls game. Bethesda is on the right track, I think. Short of suddenly finding ESO set in outerspace, we are going to buy the game when it launches, but best thing a publisher can do right now is curb our expectations so that we aren’t disappointed when the game launches without chat bubbles or something. This week’s question: Which MMO compromises can you handle without losing immersion? And as a follow-up, which items must you have in order to stay infatuated with a game world? Let me know your thoughts in the comments, and I will see you next week.